You have come to the right online store in India to find the perfect gift for your mom. Your mom is one of your best friends. She’s the first to know about everything new in your life, and you have regular hangouts.But your mom makes sure she puts her role as mother over her role as friend. So you want to gift her one perfect gift, and you are not sure about what to gift.Even if you guys are BFFs, she is your mother before she’s your bud, and even if you don’t like it, she will make sure to put your best interests at heart. Gift her something which will be memorable. Like a beautiful collage of photo frames, that could be put up at stair case, or a big blank section of wall. Your mom deserves a one ture special gift. You need to send gifts to mom. The M stands for mother, and you can always count on your mom to be there to listen.If you’re going through heartbreak or need advice, you call her up. She will listen, always, without judgment. Got a dream? You can bet your mom is there to support it, and she will constantly remind you that you need to chase it, even when you’re not so sure of it yourself.Your mom always puts family first. Gift her a family photo beautifully framed, or a set of glasses, with family names on it. Show her that she is the best mom in the world, and her kids truly love and adore her like anything. A cool mom knows that she can’t live your life for you, and she knows you’re going to date someone you shouldn’t, or hit a rough patch every now and then. But when you inevitably do, she is there to wipe away your tears. So gift her a very cool gift. Dont run out of ideas to gift to your mother. The most special person on earth deserves some extra special treatment and what better way than a personalized gift from Dezains! Remind her that she is still your favorite person as you pamper her with some special gifts for mother this year from the house of Dezains, which offers an assorted range of exclusive and personalized gift items for loved ones. Be it your mother’s birthday, anniversary or any other occasion, you are all sorted to bring a warm smile on her face. Have a look at the top 5 special gifts for mothers this year and make them feel like the queens of the world. Personalized Photo Magnet – Pamper your mother with this adorably designed personalized photo magnet which can be easily placed on cabinets and refrigerators. The beautiful image of your mother on the photo magnet not only makes it personal but an appealing memento which your mother would cherish forever. Give her better reasons to hit the kitchen more and more. Customized Canvas Photo Frame – The perfect way to surprise your mother on Mother’s Day. This special gift for your mother features an elegant picture on a high-quality canvas photo frame which can be easily customized according to your requirements. The canvas photo frame portrays a beautiful picture which has been hand drawn by professionals with extreme creativity. 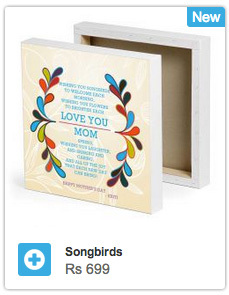 You can also customize this special gift with a personal message for your loving mother. Chipped Rectangular Crystal – Elegant and mesmerizing, this rectangular crystal depicts pure finesse, just like your mother’s personality. This special gift for your mother features a transparent and durable outlook which comes with a customized message for your dear mother. The charming crystal has a sturdy stand and can be accessorized in any part of the living room. Let your words express your heartfelt emotions for your mother and make her feel on top of the world. Personalized Cushions – This Diwali, gift your mother with something as convenient as these gorgeously designed personalized cushions. The remarkable color combination along with the personalized designs on the cushions make them appealing in the living room. The soft comfy feel of the cushions will make your mother feel relaxed after a long day at work. You can also personalize the cushions with a special message which will leave your mother with a broad smile on her face. Personalized Keyrings – If your mother keeps losing her keys, then these personalized keyrings are ideal way to let her know that how much you care for her. The keyrings are made of superior quality material with creative engraved designs on them to make them look stunning. The intricate artwork on the keyrings is complemented by the special message which is solely dedicated to your mother. These special gifts for your mother are not only thoughtful but worth possessing, which displays sheer creativity and unaltered love. Let your mother have her own special day with these wonderful gifts for mothers.